FILE - The International Atomic Energy Agency headquarters is pictured in Vienna, Austria. "The production rate [of enriched uranium] is constant. There is no change whatsoever," a senior diplomat added. Sticking to the nuclear accord is not the only way forward for Iran, Foreign Minister Mohammad Javad Zarif said Thursday. "Being the party to still honor the deal in deeds & not just words is not Iran's only option," he said on Twitter. 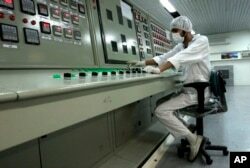 FILE - An Iranian technician works at the Uranium Conversion Facility just outside the city of Isfahan, Iran. Speaking after the IAEA report was sent to the agency's member states, French Foreign Minister Jean-Yves Le Drian said the deal was still holding, despite the U.S. withdrawal. Adhering to the deal should bring Iran economic benefits, Zarif said. "If preserving [the accord] is the goal, then there is no escape from mustering the courage to comply with commitment to normalize Iran's economic relations instead of making extraneous demands," Zarif wrote on Twitter. Le Drian said Iran, which says its missiles are only for defense, was arming regional allies with rockets and allowing "ballistic proliferation," adding: "Iran needs to avoid the temptation to be the [regional] hegemon."